Let’s face it, you are not going to buy the first standby generator you see. In fact most people research and educate themselves about standby generators to see which brand and size is best. It would be like looking at one car and then buy it without even driving it. Each brand has own qualities which make them the right choice for you. 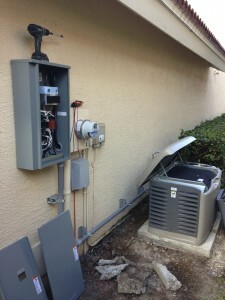 So let’s go over a few things to narrow your choices down to the right standby generator. There are 3 things you need when buying a standby generator system. A transfer switch- either manual or automatic. Most standby generators operate with an automatic transfer switch(aka…ATS). The best part about having a standby generator is that the ATS is always analyzing the incoming power. With in seconds of a power failure, it will have started your generator and safely transferred your electrical panel from utility power to generator power. When utility power returns then the process is reversed. A Standby Generator- either air cooled or liquid cooled. You can purchase an air cooled standby generator up to 20kw any thing higher is a liquid cooled standby generator. There are units that run at speeds of 1800 rpm & 3600rpm. Then difference in speed is directly proportion to how quiet the generator will operate. This is a general statement but not all 1800 rpm generators are quiet, this is where the brand comes into play. Some 1800rpm brands are much more quiet than other brands, some produce cleaner power, some handle heavier loads better and some generator brands manage loads better. I could talk about many differences in the brands but give us a call and I would be happy to talk to you about it. A fuel source- natural gas, LP gas or diesel. Most residential generators will be natural or LP gas. While commercial sites generally will have diesel. Now you know you need an ATS, a standby generator and a fuel source but what size generator should i get? That is the number one failure in the generator business- incorrect sizing. Too small…generator shuts down, too big…you have WAY OVER PAID! It’s easy to sell you a large generator but do you really need that much power? I have seen so many wrong size generator selections that could have been prevented. Most of the time the homeowner thinks he knows what he needs but is wrong or the company that is selling him the generator is not qualified. Why would you tell your Dr what should be prescribed to you or Why would you have your A/C company install your generator? You may laugh but I have seen this so many times. Your generator size depends on your needs or wants in a power failure. There are many ways to set up a standby generator system. There are many things to consider and we can help you correctly size and set-up your standby generator based on many factors at the most cost effective price. West Coast Generators represents Kohler, Generac, Briggs & Stratton and GE and can fit the best brand for you.